60 Bridges. We closed the river Rhine down twice to bridge it. Also played football for the 37 group on TDY. Lots of places were a reflection of the war. I really enjoyed my time in Germany. A fond memory is of a Pizza place in heart of town, run by a guy from the states. Sorry I do not have photos to upload right now. Remember seeing the Grimm Brothers statue many times. Loved going for a Snitzel dinner in the guest houses. Was stationed in Hanau with the 23 rd armored engineers of the 3rd armored Division.was able to see a lot of the county,was stationed in the Hessian Homburg caserin,enjoyed my time there. Left just before the Revolt in Hungry,was glad to get back to the states . 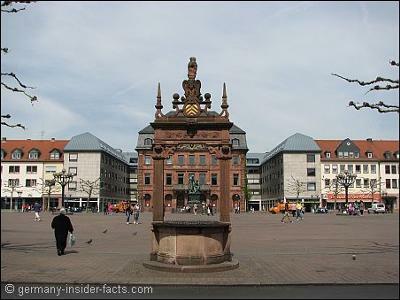 Hello Joseph, I read your comments,and I agree with you,Hanau is a beautiful City.Someday I would like to visit it again,its been a long time for me(1957-1959)I enlisted in 1956 and was in Germany in march of "57",so my time was spent driving army trucks around Germany. I did see much of Hanau,but I wished I could have seen much more of this city. I know once you seen what the people were like and how you were treated,it made you enjoy your tour alot more.I hope there are more updated photos of the city posted,so I may have a chance to see them.I was with the 589th Engineer Supply Co,back then, and got to see alot of Germany and a few castles on my many trips around Germany,the country is a must see country if you are going to visit. I was born in 1954, so I have some faint memories of what Hanau looked like at that time. Much has changed since then. The Brothers Grimm still guard the market place. You still get a decent Snitzel at some restaurants, however, you really have to look for it. I am always surprised that people like you, who were stationed in Hanau many years ago, still have fond memories of my home town.